This is another one from anti-creationist science writer Jonathan Sherwood, who took issue with one of Dr Jonathan Sarfati’s articles on thermodynamics (extracts in green, and doubly indented). See Some thermodynamics criticisms — and answers for his first letter about one of our thermodynamics articles. Mr Sherwood’s letter is printed below (dark red singly indented), then reprinted with a point-by-point response from Dr Sarfati (black, not indented). In this past week’s ‘Feedback’ article, ‘Some thermodynamics criticisms — and answers,’ Jonathan Sarfati suggested that I may ‘have a quite amateurish understanding of the topic.’ He suggested that I read more about the second law of thermodynamics on [this] web site to improve my understanding. I have read one of Dr Sarfati’s articles on thermodynamics, and have commented on it below. For the most part, I only addressed the errors, but since the article departs from the predominant theme of thermodynamics halfway through, I felt obligated to follow Dr Sarfati’s stream of thought. An isolated system exchanges neither matter nor energy with its surroundings. In such a system, entropy never decreases. The universe is an isolated system, so is running down. This is incorrect. The total entropy never decreases, but that is not what you’ve said. The second law does not prevent entropy from decreasing in localities within the system. By suggesting that entropy never decreases you suggest that car engines, growing seeds and the evaporation/precipitation cycle of water are impossible within our universe. The distinction is important. … there are no known violations of the second law of thermodynamics. Ordinarily the second law is stated for isolated systems, but the second law applies equally well to open systems. … There is somehow associated with the field of far-from-equilibrium thermodynamics the notion that the second law of thermodynamics fails for such systems. It is important to make sure that this error does not perpetuate itself. Your use of this quote is extremely misleading. You use it in such a way to suggest that evolutionists believe that the second law fails for some reason in regards to evolution. Anyone who would think the second law fails or can be dismissed is incorrect. Evolutionists are correct, however, when they point out that the second law’s demand that entropy must increase does not apply to open systems. If it did, then there would be no way for entropy to decrease, as we know it can. Dr Ross is saying that the second law is always in force, which is correct. He is not saying that entropy must always decrease. It does not have to in an open system. Open systems still have a tendency to disorder. There are special cases where local order can increase at the expense of greater disorder elsewhere. One case is crystallization, covered in Question 2 below. The other case is programmed machinery, that directs energy into maintaining and increasing complexity, at the expense of increased disorder elsewhere. Living things have such energy-converting machinery to make the complex structures of life. >There are, of course, more cases, such as the evaporation of water and precipitation, warm air rising, sand grain sorting on a beach, even heat being absorbed by a rock. The open systems argument does not help evolution. >You are absolutely correct! The second law does not support evolution. Nor does it conflict with it. Raw energy cannot generate the specified complex information in living things. There is little doubt that simple energy is not enough to recreate the living things we see around us today. I know of no scientist that would suggest such a thing. What is your exact definition of ‘specified complex information?’ I have looked through your web site, but am unable to find a definition. I would also be interested in knowing if you are suggesting that the second law prevents this specified complex information from arising naturally. I suggest that thermodynamic arguments are excellent when done properly, and the ‘open systems’ canard is anticipated. Otherwise I suggest concentrating on information content. >‘Information content’ would indeed be an interesting discussion. But perhaps we should concentrate on resolving the thermodynamic question for the moment. Answer 2: Rensberger is ignorant of the creationist responses to this argument. An energy source is not enough to produce the specified complexity of life. The energy must be directed in some way. The ice cubes of his example would not form if the electrical energy was just wired into liquid water! Instead, we would get lots of heat, and the water breaking up into simpler components, hydrogen and oxygen. To use the evaporation/precipitation example again: Adding nothing more than heat energy to a system consisting of nothing more than a bucket of water in a glass shell will result in the water evaporating and condensing on the shell. The water near the top of the shell will have much more potential energy, i.e. decreased entropy, then before the energy was added. The heat source would not need to be ‘directed’ in any way. Granted, decreasing the entropy of a few drops of water is a far cry from creating life, but it is a rock-solid example of how entropy can decrease without intelligent direction. The ice example is thermodynamically irrelevant to the origin of life. But the formation of proteins and nucleic acids from amino acids and nucleotides not only lowers their entropy, but it removes heat energy (and entropy) from their surroundings. As the bucket example shows, decreasing entropy at the expense of increased entropy elsewhere does not violate the second law of thermodynamics. Or are you suggesting that the formation of proteins somehow decreases their entropy and the entropy of their surroundings as well? Rensberger also fails to distinguish between order and complexity. Crystals are ordered; life is complex. To illustrate: a periodic (repeating) signal, e.g. ABABABABABAB, is an example of order. However, it carries little information: only ‘AB’, and ‘print 6 times’. 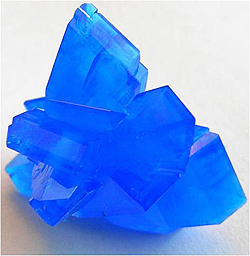 A crystal is analogous to that sequence; it is a regular, repeating network of atoms. Like that sequence, a crystal contains little information: the co-ordinates of a few atoms (i.e. those which make up the unit cell), and instructions ‘more of the same’ x times. If a crystal is broken, smaller but otherwise identical crystals result. Conversely, breaking proteins, DNA or living structures results in destruction, because the information in them is greater than in their parts. So you’re saying that the difference between the information in a crystal and DNA is only that DNA’s information comes in large sections? If you break a molecule of NaCl, you will no longer have salt, just as if you break a strand of DNA you will no longer have viable DNA. What about a crystal that is more than a single molecule in chemical makeup? Doesn’t that, by your definition, have more information than its parts? Are ‘parts’ defined at the atomic, molecular, or super-molecular scale? Proteins and DNA are also non-random aperiodic sequences. 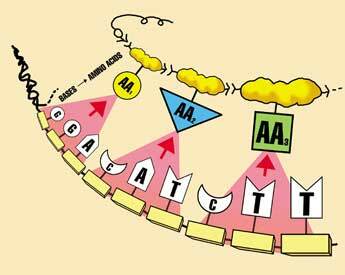 The sequences are not caused by the properties of the constituent amino acids and proteins themselves. This is a huge contrast to crystal structures, which are caused by the properties of their constituents. Now that’s a real difference. You’re saying that DNA creates the mechanism that gives it its sequence, whereas crystals have their sequence determined by their own structure. I can accept that as a defining difference, though there is no doubt a gray area where we’d have to show how DNA is not a property of four amino acids, as a crystal is a property of a specific molecule. This, of course, opens up another can of worms, such as: Are prions more akin to DNA or to crystals? The sequences of DNA and proteins must be imposed from outside by some intelligent process. Whoops. You made a significant leap in logic there. It’s one thing to say that crystals and DNA are fundamentally different, and another to announce that DNA is designed by intelligence. Nothing you’ve presented singles out intelligence as the only possible cause. Proteins are coded in DNA, and the DNA code comes from pre-existing codes, not by random processes. Again, you have not shown this at all. You have merely shown that crystals and DNA are different from one another. And as a side note, no one has suggested that life arose by pure randomness. Selection is a non-random process. It, together with randomness, equals non-randomness. No one suggests that pure random processes gave rise to DNA. To make a protein, scientists need to add one unit at a time, and each unit requires a number of chemical steps to ensure that the wrong type of reaction doesn’t occur. Accepted. And note that this does not in any way violate the second law. Question 3: Did the 2nd Law begin at the Fall? It is more likely that God withdrew some of His sustaining power at the Fall. This is very interesting. Do you have any definitions of this ‘sustaining power?’ Can you articulate any of its properties? Are there any experiments we could conduct to see the effect of this power? I don’t actually disagree with your point. All the same, I doubt that anyone with experience with thermodynamics would have understood the above as referring to anything but the total entropy. This is especially so when I cover the point you raise in my article with the statements about open and closed systems, which in your case would be within the isolated system. But I’ve edited the article to read ‘The total entropy of an isolated system never decreases,’ which will hopefully make things clearer. Many evolutionists in our experience do claim this! One of our staff some years ago was confronted in a debate with the comment that the Second Law could not be applied to living things! As I said in my previous response, most leading evolutionists are not qualified in thermodynamics, so why should anyone be surprised that they make mistakes? Therefore my quote was not misleading in the context in which I quoted it. Agreed, and I say so in the next part you quote. There are, of course, more cases, such as the evaporation of water and precipitation, warm air rising, sand grain sorting on a beach, even heat being absorbed by a rock. These examples of ordering, not complexifying, are already covered in my previous response by the Curie Dissymmetry Principle, i.e. that a dissymmetry in a physical effect is always present in its physical cause. For example, take the case of sand grain sorting. A random mixture in zero gravity has no dissymmetry (it is isotropic). Introduce a gravitational field, then there is a dissymmetry because of the direction of the field. Then the sand grains can ‘self-sort’ with the density increasing with depth. But this new arrangement, with the directional arrangement of sand grains, actually reflects the dissymmetry of the gravitational field that causes the separation. You are absolutely correct! The second law does not support evolution. Nor does it conflict with it. But that’s generally what they do imply. See for example, Be Skeptical About the Skeptics! Part 3: Fridges and Hot Air. So often they think they can answer the creationist thermodynamic argument by pointing out that energy is flowing to Earth from the sun. You imply something similar yourself when you bring up all these examples of spontaneous ordering which have nothing to do with spontaneous complexifying. That’s strange, because this very article gives clear examples of randomness, order and specified complexity. I should also point out that we have defined information in Q&A: Information, which includes articles with standard quantitative definitions as well as the qualitative examples. The best single reference would be The Mystery of Life’s Origin, Ch. 8, which I cited in my article. The Second Law cannot prevent anything, since it is about probabilities. The Law can be used to show that the probability of an event happening by natural processes is so small that no one could logically believe that natural processes caused the event. This includes the origin of just one of the proteins upon which life depends – see also Q&A: Probability. ‘Information content’ would indeed be an interesting discussion. But perhaps we should concentrate on resolving the thermodynamic question for the moment. To be fair, I was writing a stand-alone article to advise people on how to answer critics and suggest another way of presenting the case. It wasn’t written in the context of ongoing debate. And information is not unrelated to the thermodynamic issue, since the information content of a biological molecule is the reduction of configurational entropy compared to a random polymer of the same composition (also explained further in The Mystery of Life’s Origin, Ch. 8, as mentioned above). There is a direction (dissymmetry) introduced in that the shell is cooler than the bucket. But again, I fail to see how this is relevant to evolution. Again you are missing the point of order v complexity. As I pointed out, I’ve never claimed it does. I was discussing the spontaneous formation of biopolymers from standard concentrations of monomers. This would indeed decrease the entropy of both system and surroundings at any temperature, unlike crystals which increase the entropy of the surroundings below the freezing point by releasing the latent heat. I explain further in Origin of Life: The Polymerization Problem. The information needed to have Na+ and Cl– spontaneously form into a salt crystal is already inherent in the ingredients – nothing has to be imposed from the outside. But the raw ingredients of a protein (the amino acids) do not contain the ingredients necessary for a functional protein to arise spontaneously. … the difference between crystallisation and spontaneous assembly of biopolymers is qualitative, not just quantitative. So you’re saying that the difference between the information in a crystal and DNA is only that DNA’s information comes in large sections? That’s why we said that DNA has high information content, while a crystal has low information content. The generation of high specified complexity is a huge problem for evolution. Correction: salt is an ionic solid, not a molecular one, so its smallest components are Na+ and Cl– ions, not NaCl ‘molecules’. … just as if you break a strand of DNA you will no longer have viable DNA. Crystal structures of CuISe3 and CuBrSe3; black circles = Cu, small open circles = Se, large open circles = Br or I. From J.D. Sarfati and G.R. Burns: ‘The pressure, temperature and excitation frequency dependent Raman spectra; and infrared spectra of CuBrSe3 and CuISe3’ Spectrochimica Acta 50A: 2125–2136, 1994; after W. Milius and A Rabenau, Mat. Res. Bull. 22:1496, 1987. That part is right. But if you break up a large crystal of salt into smaller crystals, you still have salt. Another way of putting it is that the information needed to have Na+ and Cl– spontaneously form into a salt crystal is already inherent in the ingredients – nothing has to be imposed from the outside. But the raw ingredients of a protein (the amino acids) do not contain the ingredients necessary for a functional protein to arise spontaneously. So it is not just a matter of a ‘scale’ issue, i.e. the difference between crystallisation and spontaneous assembly of biopolymers is qualitative, not just quantitative. What about a crystal that is more than a single molecule in chemical makeup? The smallest unit of a crystal is often considered to be its unit cell, and the crystal is built up simply by repetitions of this by specific multiples of translation vectors. 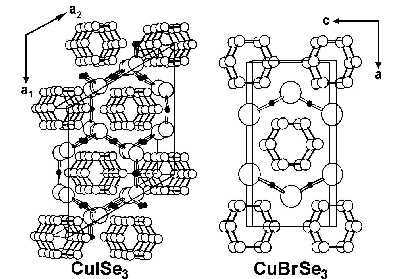 My own Ph.D. thesis included published papers on CuBrSe3 and CuISe3, and the latter has a very complex structure by normal inorganic chemical standards, with 18 formula units in each hexagonal unit cell, or six per rhombohedral unit cell (see diagram, right). But the information content of this is still tiny compared with that of DNA or most proteins. Doesn’t that, by your definition, have more information than its parts? Are ‘parts’ defined at the atomic, molecular, or super-molecular scale? Sure, a chemical compound is not just the sum of the properties of its elements. But you appear not to be aware of the smallest unit of crystals. As the arrangement of a printed page is extraneous to the chemistry of the printed page, so is the base sequence in a DNA molecule extraneous to the chemical forces at work in the DNA molecule. It is this physical indeterminacy of the sequence that produces the improbability of any particular sequence and thereby enables it to have a meaning – a meaning that has a mathematically determinate information content. — Michael Polanyi, physical chemist. Except that DNA would be a property of four nucleotides, not amino acids. I will be charitable and presume that a science writer actually knows this and just slipped momentarily. But if a creationist had made such a slip, many evolutionists would parade this as an example of scientific incompetence. (In my own article I had correctly referred to ‘the formation of proteins and nucleic acids from amino acids and nucleotides’ but later made the wrong juxtaposition of ‘Proteins and DNA … sequences are not caused by the properties of the constituent amino acids and proteins themselves’, when as before it should have been ‘properties of the constituent amino acids and nucleotides’. It’s now corrected). ‘As the arrangement of a printed page is extraneous to the chemistry of the printed page, so is the base sequence in a DNA molecule extraneous to the chemical forces at work in the DNA molecule. It is this physical indeterminacy of the sequence that produces the improbability of any particular sequence and thereby enables it to have a meaning – a meaning that has a mathematically determinate information content.’ [Life’s irreducible structure, Science 160:1308, 1968]. Prions seem to be mis-folded proteins, which induce chemically identical but hitherto correctly folded proteins to mis-fold as well. Indeed, this raises the can of worms of the design behind a class of proteins called chaperones needed for correct folding, and how the first chaperones could have folded without pre-existing chaperones. See The Origin of Life: A Critique of Current Scientific Models (PDF file). It follows from the principle of analogy, on which much science is based (Darwin frequently made use of what he thought were good analogies, e.g. natural selection and breeding) – everywhere we know the cause of specified complex information, it is intelligence. Even where we don’t know, e.g. archaeological artefacts or crime scenes, and even in hypothetical signals from space, that SETI folk hope to discover, specified complexity is considered conclusive proof of an intelligent message sender. It’s only in biology that the exception is made, and this is known as special pleading, which in turn arises from materialistic bias. This is well shown in quotes from Lewontin and Todd. But natural selection is differential reproduction, which presupposes a self-reproducing entity. 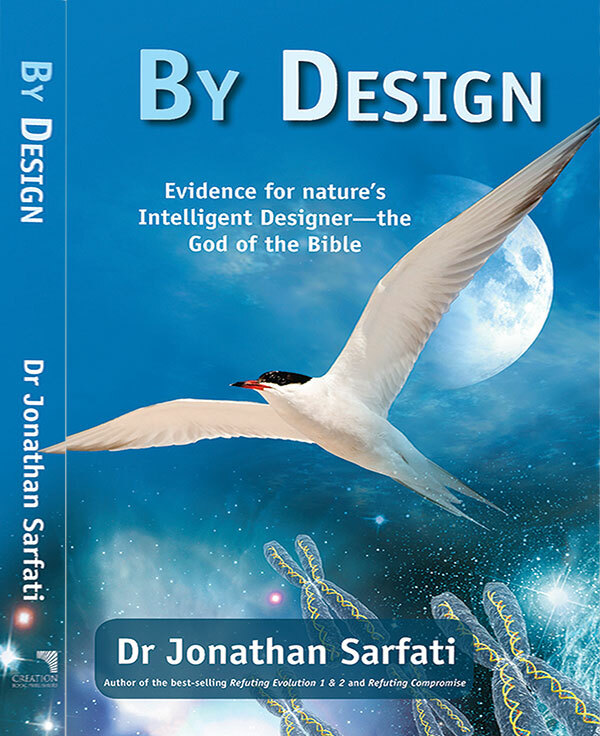 Therefore natural selection cannot explain the origin of first life, as leading evolutionist Dobzhansky strongly affirmed and former atheist Antony Flew realized. So chemical evolution does posit a random origin of life. Note that I never claimed that it did. First, this was part of a section advising creationists not to use an unsound argument popular in some creationist circles. It was not intended to be a primer on God’s sustaining power. Second, we have covered this issue elsewhere. For example, in the section Creationist contributions to science, we point out how belief in God’s regular sustaining power provided the foundation for experimental science. So we couldn’t conduct scientific experiments to ‘prove’ this, because it’s meta-scientific – it underlines the validity of the experiments themselves. Note that materialist empiricists are in a worse position – there is no experiment that could prove the validity of empiricism! But an atheist has to regard the orderliness of the universe as an axiom, a proposition accepted without proof, and which bears no relation to his other axiom of atheism. The Biblical theist is in a better position because he can treat the orderliness of the universe as a theorem, derived from his axiom that the Bible’s propositions are true, including that the universe was created by a God of order, not confusion. See further explanation on the presuppositions required for science to work.